Will tax plan turn cash-hoarding companies into spenders? Tue., Dec. 19, 2017, 10:44 a.m.
NEW YORK – Big U.S. companies have been piling up cash for years, but have spent little of it on buying equipment and raising wages and other things to grow the economy. Republicans say they know how to fix this: Give companies even more money by cutting their taxes. The $2.6 trillion in cash that U.S. companies have stored abroad is enough to send a check for more than $7,000 to every man, women and child in the country. The tax plan overhaul would add to that pile under the theory that more money will get companies to invest more, hire more and increase pay for their workers. The conservative Tax Foundation estimates that the entire overhaul could lead to 4.8 percent more spending by companies on equipment and other capital goods over a decade, and an additional 1.5 percent boost to wages. Many experts think that is wishful thinking. Critics say the companies are more likely to use their tax savings to buy back their own stock and send dividend checks to investors than to expand operations. While the stock market has risen on the expectation of higher earnings, the bond market doesn’t seem convinced that the plan will accelerate economic growth all that much. Long-term interest rates have remained low even as the Federal Reserve has raised short-term rates. That’s a signal that bond investors aren’t forecasting that big a pickup in inflation or economic growth. Under the bill coming up for a vote in Congress, the corporate tax rate would be slashed from 35 percent to 21 percent. Companies hoarding cash overseas would also get a one-time tax break if they send the money back to the U.S. And they will be able to immediately expense 100 percent of the cost of big ticket purchases against taxes, saving even more. 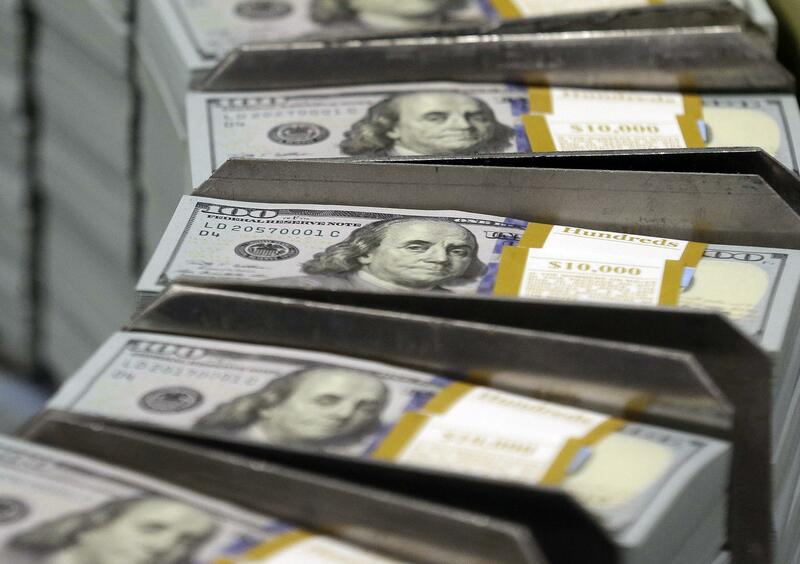 A look at the ways companies could spend their tax windfall, and the odds they will do so. By all accounts, wages should be surging. The last time the unemployment rate was so low, in 2000, workers were getting an average 4 percent raise each year. By contrast, wages are rising now at just 2.5 percent. Economists are unsure why raises are so puny, but one thing is certain: It has nothing to do directly with how much money companies get to keep after paying taxes. Companies generally raise wages only if they are forced to because they need people to do a certain job and there aren’t enough of them. In recent decades there’s been a surge in the number of workers globally as hundreds of millions of Chinese and Indians entered the middle class, helping keep wages down. If the tax bill helps the economy grow faster and companies have to produce more, they may have to offer higher wages to attract more workers. The Treasury Department has said the Senate version of the tax bill would increase growth by 0.7 percent a year over the next decade, but independent estimates are much lower. Congress’s nonpartisan Joint Committee on Taxation estimated that growth would increase by 0.08 percent a year. Proponents say the tax bill should spur companies to spend more on computers, software and other big ticket items. To get companies to invest more, you have to make it more profitable for them, said Scott Greenberg, a senior analyst at the Tax Foundation. This goes beyond just lowering the rates. The tax bill would temporarily allow companies to write off all the money used in investments against taxes in just a year, instead of spreading out that benefit over many years. There would be full and immediate expensing for five years, after which it would gradually be phased out. “Tax changes that lower the cost of investment cause companies to make more investments –to buy more machinery, to put up factories, to purchase more equipment,” Greenberg said. If companies make those investments, that would make their workers more productive, and thus able to demand higher pay. But Greenberg said the impact of the investment break on taxes is limited, though, because the benefit runs out in five years. He prefers a permanent break. Critics say the main reason companies haven’t been investing has nothing to do with incentives. It’s because there has been too much investing in previous years. Even before the 2008 financial crisis the world had too much of nearly everything – raw materials like steel and oil , workers, factories to employ them and consumer products – which is why inflation has stayed low for many goods. Then the Chinese government encouraged even more production with a big stimulus program in the years after the crisis, and the glut got worse. Asked about the possibility of using tax savings on capital spending, Marriott International CEO Arne Sorenson last month quickly shot down the idea, saying there is already “extra capacity” at the company. “We don’t need to invest in our system,” he said. What Marriott is likely to do is what it’s done in the past: Buy back its stock. Corporate America has been spending trillions on their own stock in recent years, and the pace has barely eased up. S&P 500 companies spent $517 billion on these buybacks in the 12 months through September, according to S&P Dow Jones Indices. If history is any guide, the tax overhaul will only fuel more buybacks. The bill would offer an incentive to companies to return cash they’ve kept overseas by taxing it at discounted rates of 15.5 percent for liquid assets and 8 percent for illiquid assets. The U.S. would eventually transition to a system that imposed a small tax on extremely large foreign profits. Published: Dec. 19, 2017, 10:44 a.m.